A few days ago, the KDESvn repository was converted from Subversion to Git. It’s now hosted on git.kde.org ! If you added the KDE Release calendar to your favorite organizer, you probably noticed that KDE 4.8.1 will be released in a couple days. Bug 291902: KMail crashed adding new IMAP account. Is Kmail still being developed? This question was posted on the KDE forum a few days ago and deserves an answer. Yes, KMail is maintained, It even has a new maintainer since a few months. Laurent Montel now takes care of KMail2 and already made an awesome work. So, what’s the state of KMail in KDE 4.7 ? Since the 4.7.0 tag, 556 commits were made in kdepim/kmail. Since the creation of the KMail2 product, 690 bugs were marked as RESOLVED. 259422 Kmail ignores trash folder setting. It moves deleted emails to the local trash folder. With kdepim and kdepim-runtime 4.6 release getting close, I think it’s finally time to squash the KMail 1 bug reports. In a couple of hours, I’ll close the KMail product, which means reporting new bugs will not be possible anymore. The bugs audit will then begin. If a given crash is reproducible, open a new KMail2 report with a fresh and useful backtrace and a link to the old report. What to do with the wish reports has yet to be defined. I think evaluating the ones which received the most votes and discard the others is probably the best choice. You have KDEPIM 4.6 beta 5 installed ? What about starting with triaging your own bugs ? 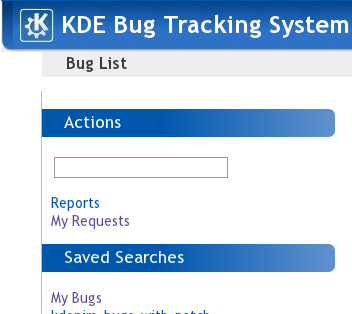 Once logged on https://bugs.kde.org, click on “My bugs” voilà, you’re ready to triage. Want more ? visit https://bugs.kde.org/component-report.cgi?product=kmail, pick a category and check whether you’re able to reproduce the original report. Drop a comment to the report if you cannot close it.